Pat Jackson, born in Eltham, south London in 1916, was instrumental, along with J. B. Holmes and Harry Watt , in developing the 'story documentary' during the Second World War, and subsequently worked to promote realist narratives in commercial fiction cinema. On his seventeenth birthday in March 1933 Jackson joined the GPO Film Unit as an assistant, working in this capacity on several key productions, including Night Mail (Basil Wright and Harry Watt, 1936). His first directing assignment was The Horsey Mail (1938), a one-reel informational film about the postal service in a remote Suffolk village. Though clearly an apprentice piece, this film provides some important pointers towards his future directing style and technique, notably the prominence given to the local postman's role in the life of his community. Jackson's most celebrated documentaries were produced during the war years. The First Days (1939), co-directed with Harry Watt and Humphrey Jennings , contrasted everyday routine with the political and social upheaval of the 'phoney war' period of autumn 1939, and was the first significant wartime documentary. After more shorts, including films on public health and the work of ferry pilots, Jackson made Western Approaches (1944), the film for which he is now best remembered. Western Approaches remains remarkable for its technical proficiency, narrative drive, and the performances of its non-professional cast. A merchant ship in one of the Atlantic convoys is torpedoed by a German submarine while attempting to rescue survivors from an earlier attack. The submarine is sunk in a subsequent battle and the sailors are eventually rescued. Apart from one scene, the film was produced entirely at sea; six gruelling months were spent on the lifeboat scenes alone. Shooting in Technicolor generated extra difficulties, with the huge, beam-splitting camera and studio lighting rigs placed in the lifeboat and on board merchant ships. Also remarkable were the fresh, uncontrived performances of the merchant navy crew who formed the cast. The technique of using improvisation to develop scenes in which individuals depict their professional roles within a fictional framework had been used by Harry Watt , Humphrey Jennings , and others in their story documentaries; but the ambition and scope of Western Approaches set the film apart from its predecessors. After the war, Jackson went to Hollywood under a contract with MGM brokered by Alexander Korda . His experience was not a happy one, and after Shadow on the Wall (1949), a B-movie thriller about a child who accidentally witnesses the murder of his stepmother, Jackson returned to the UK. Here he directed by far his best commercial feature, White Corridors (1951), an adaptation of a wartime novel by Helen Ashton about the work of a provincial hospital. The script updated the material, placing Yeoman's Hospital in the Midlands within the new National Health Service, for which the film served as subtle propaganda. But the chief focus rests on the human drama found in the hospital's daily round, much of it triggered by a boy seriously ill with blood poisoning. Drawing upon all his story documentary skills, Jackson blends the diverse story-lines, emotional dramas and moments of comic relief with a remarkably sure hand, smoothly integrating the realist aesthetic with the commercial feature's narrative needs. Performances are excellent, particularly those by Googie Withers and James Donald , the conscientious young doctors. Though White Corridors was a popular and critical success, Jackson received little encouragement to further the semi-documentary approach in features. The Feminine Touch (1956), made for Ealing , revisited hospitals and nursing, but allowed soap suds to dominate. The Birthday Present (1957) pursued the consequences of a white-collar crime with appealing sobriety, but remains, like most of Jackson's later films, modest both in execution and intent. 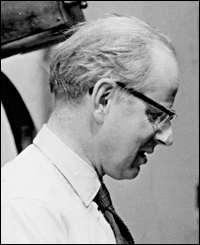 He worked increasingly in commercial television, directing several episodes of popular dramas in the 1960s and 70s, including Danger Man , The Prisoner and The Professionals ; cinema work became mainly confined to independent producers and second features. A little of the documentary spirit surfaces in Virgin Island (1958), a benign tale of love and romantic hardship on the Virgin Islands, and a concern for eerie atmosphere strengthens the thriller Don't Talk to Strange Men (1962). Jackson enjoyed his biggest commercial success with What a Carve Up! (1961), a lively 'old dark house' comedy thriller which strikes a fine balance between laughs and thrills, but it is not a film that ever suggests the brilliant young innovator of Western Approaches . Sussex, Elizabeth, The Rise and Fall of British Documentary (Berkeley: University of California Press, 1975).